Horses Communicate Effectively when they Need Help: New Study – FIREPAW, Inc. If they are paying attention, humans who care for animals know that their non-human animal counterparts can communicate their needs quite well. When it comes to horses, we have a new study that has demonstrated those communication skills scientifically. Some domestic animals are thought to be skilled at social communication with humans due to the process of domestication. Horses, being in close relationship with humans, similar to dogs, might be skilled at communication with humans. Previous studies have indicated that they are sensitive to bodily signals and the attentional state of humans; however, there are few studies that investigate communication with humans and responses to the knowledge state of humans. Our first question was whether and how horses send signals to their potentially helpful but ignorant caretakers in a problem-solving situation where a food item was hidden in a bucket that was accessible only to the caretakers. We then examined whether horses alter their behaviors on the basis of the caretakers’ knowledge of where the food was hidden. We found that horses communicated to their caretakers using visual and tactile signals. The signalling behavior of the horses significantly increased in conditions where the caretakers had not seen the hiding of the food. These results suggest that horses alter their communicative behavior towards humans in accordance with humans’ knowledge state. 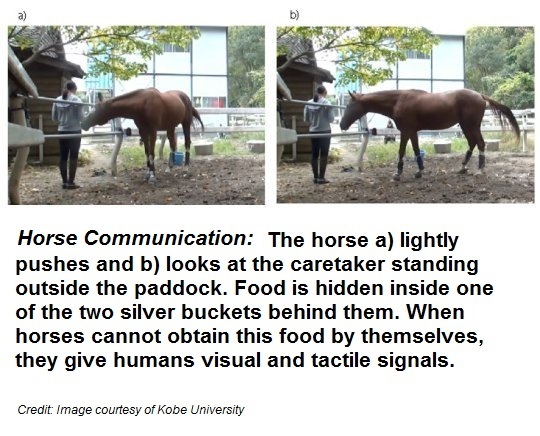 Researchers at Kobe University Graduate School of Intercultural Studies have demonstrated that when horses face unsolvable problems they use visual and tactile signals to get human attention and ask for help. The study also suggests that horses alter their communicative behavior based on humans’ knowledge of the situation. These findings were published in the journal of Animal Cognition. In this study, scientists investigated horses’ social cognitive skills with humans in a problem-solving situation where food was hidden in a place accessible only to humans. The experiment was carried out in a paddock belonging to the equestrian club at Kobe University, where eight horses from the club participated with the cooperation of their student caretakers. For the first experiment, an assistant experimenter hid food (carrots) in a bucket which the horse could not reach. The researchers observed whether and how the horse sent signals to the caretaker when the caretaker (unaware of the situation) arrived. The horse stayed near the caretaker and looked at, touched and pushed the caretaker. These behaviors occurred over a significantly longer period compared to cases when they carried out the experiment without hiding the food. The results showed that when horses cannot solve problems by themselves they send signals to humans both visually (looking) and physically (touching and pushing). Building on these results, for the second experiment they tested whether the horses’ behavior changed based on the caretakers’ knowledge of the hidden food. If the caretaker hadn’t watched the food being hidden, the horses gave more signals, demonstrating that horses can change their behavior in response to the knowledge levels of humans. These two experiments revealed some behaviors used by horses to communicate demands to humans. They also suggest that horses possess high cognitive skills that enable them to flexibly alter their behavior towards humans according to humans’ knowledge state. This high social cognitive ability may have been acquired during the domestication process. In order to identify the characteristic that enables horses to form close bonds with humans, in future research the team aims to compare communication between horses, as well as looking more closely at the social cognitive ability of horses in their communication with humans. Journal source: Ringhofer, M. & Yamamoto, S. Domestic horses send signals to humans when they face an unsolvable task. Animal Cognition, 2016. Pingback: Horses use facial and voice cues to determine human’s emotional state – FIREPAW, Inc.